A noncombustible rock that is organic or formed by organic accumulation of minerals: Acaustobioliths include diatomite, radiolarite, phosphorite, and some limestones. A procedure in which a very hot iron is used as the cauterizing agent. Treatment of disease by application of steam. An apparatus used in atmocausis. An surgical dissection in which both active and return electrodes are incorporated into a single hand-held instrument, so that the current passes between the tips of the two electrodes and affects only a small amount of tissue. 1. Relating to, or having the properties of, a caustic curve formed by reflection. 2. A caustic curve formed by reflection of light. Sensation of heat even when the temperature is low: To suffer from caumesthesia in a northern climate could be dangerous because the patient might dress inappropriately to go outside in the winter. 1. Persistent severe burning sensations, usually following partial injury of a peripheral nerve (especially median and tibial) or the brachial plexus, accompanied by trophic changes. 2. Sensation of burning pain in the distribution of a peripheral nerve, associated with glossy skin devoid of hair or wrinkles. Other associated changes include swelling, redness, sweating, and curling of the nails. Causalgia is usually due to irritation of a nerve by injury; the median or sciatic nerves are most commonly involved. Divination with fire; “it is a happy presage when combustible objects don’t burn when thrown into the fire”; it was a good omen if something failed to burn or took a long time to catch on fire. 1. Relating to a chemical substance that can burn or corrode organic tissue: Lye is extremely caustic, or vitriolic, in that it causes damage to the skin. 2. Pertaining to a strong and powerful acid which is able to eat away and destroy by chemical action: Because the cleaning agent was so caustic, Janet had to wear gloves to protect her hands. 3. A reference to harsh or corrosive verbal expressions or severely critical and very sarcastic speech that is intended to mock, to offend, or to belittle someone: After cleaning the hotel rooms, Jane received nothing but caustic and scathing remarks from the owner, saying that they were dirtier than before, after which she quit her job on the spot! 4. Conveying a burning or stinging sensation, as from an intense emotion: After being in the terrible car accident and seeing death before him, Don had a such a caustic fearfulness of such vehicles that he never put his foot into an automobile again! 5. 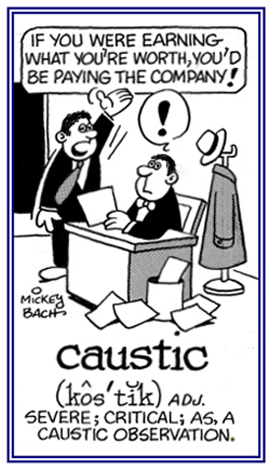 Etymology: from Greek kaustikos, then from Latin causticus, from kaiein, kau-, "to burn"
Kaustos, "burnt", is the basis of the English words cauterize and caustic; literally of caustic lime, that which burns, and figuratively of caustic words that "burn" their recipients. The quality of acting like fire on animal matter, or the quality of combining with the principles of organized substances, and destroying their texture. This quality belongs to concentrated acids, pure alkalis, and some metallic salts. 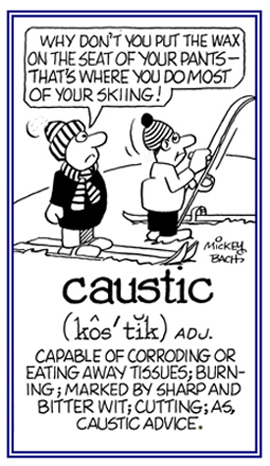 To render to make caustic. A combustible organic rock, such as coal peat, of plant origin. A hot iron for searing or cauterizing. Cross references of word groups that are related, directly, indirectly, or partly to: "fire, burn, glow, or ashes": ars-, ard-; -bust; cand-, cend-; crema-; ciner-; ether-; flagr-; flam-; focus, foci-; fulg-; gehenna-; ign-; phleg-; phlog-; pyreto-, -pyrexia; pyr-; spod- (ashes; waste); volcan-. Showing page 1 out of 4 pages of 52 main-word entries or main-word-entry groups.